I was only just recently introduced to the work of Olga de Amaral, a Colombian textile artist, who since the 1950s, has been weaving the most breathtaking works of art. What immediately caught my eye was de Amaral’s use of color and texture, but a deeper look into the artist’s inspirations reveals a deep spiritual quality that deftly ties together her cultural heritage and surrounding landscape. De Amaral was trained in architectural drawing at the Colegio Mayor de Cundinamarca in Bogotà, where she learned the principles of perspective, logic, and mathematical order. However, it was not until she enrolled at Cranbook Academy of Arts in 1954 that the artist began to apply these principles to weaving. Upon her return to Colombia the following year de Amaral was unable obtain the materials to which she had become accustomed in the United States, leading the artist to rediscover the local peasant looms that recalled the ancient fiber and textile processes of her ancestors. Strengthening these ties with her native culture, De Amaral also began to experiment with virgin wool, pita fiber, luffa, tire, and colors obtained directly from her surroundings. The resulting works also came to reflect her native Colombia. De Amaral created a series of woven wall, influenced by her love of adobe walls. The thick matted quality found in many of her textiles is reminiscent of the old plaster covering the Colombian countryside homes she explored as a child. The patchwork quality of other works is derivative of the quilts her mother made out of men’s ties. The influx of gold seen in her later pieces were inspired by a trip to Popayan, Colombian, where she was struck by the spirituality of the golden artifacts from Spanish churches. De Amaral plaits textured fibers together by hand. She then uses this handmade fabric as a kind of rarified painter’s “canvas,” first applying gesso and then painting it with acrylics or with gold and silver leaf. 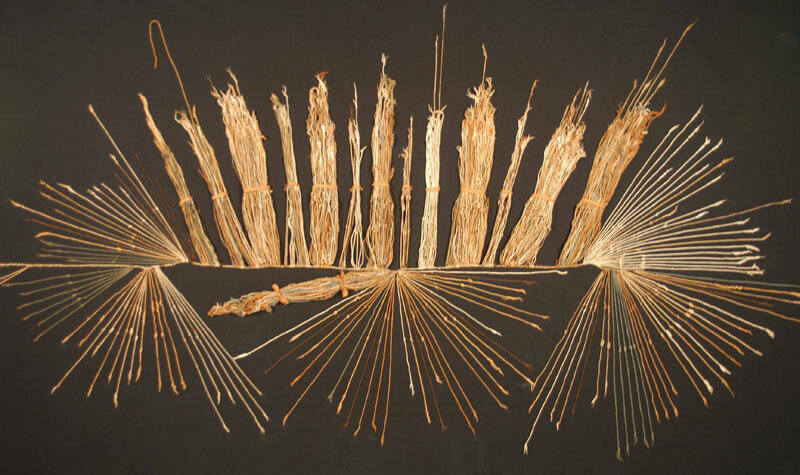 The knotted features of work was the direct influence of the time she spent exploring Machu Pichu, Peru, and learned about quipos (a system of annotation and memory based on fiber composition, colors, and knots). While Olga de Amaral’s work is greatly influenced by peasant life, Native American culture, and Latin heritage, the artist simultaneously relating it to the contemporary art growing around her. More obviously connections are to fiber artists Eva Hesse and Sheila Hicks. However, one can see the influence of Yves Klein’s Monogolds in de Amaral’s golden tapestries. The artist’s metallic surfaces are also reminiscent of Lucio Fontana while the dense, abstract surfaces and lack of mimetic imagery of de Amaral’s pieces also recall Mark Rothko. Olga de Amaral is exhibited internationally and her works can be found in such prestigious collections as MoMA, Metropolitan Museum of Art, Art Institute of Chicago, Kyoto Museum of Modern Art, and Musée de l’art moderne de la ville de Paris.